What is Conscious Feeling? It is being aware of what you are feeling and honoring your emotions. When you honor where you are it is easier to heal, releasing emotional energy that no longer serves your highest and best good. Lepidolite radiates Soft soothing vibrations woven by Earth Mother into a powerful combination of soft purplish pink interwoven with Lithium Mica and Pink Tourmaline. The emotional and mental energy bodies are interconnected and interwoven one with the other. What does this mean for you? It means that when you are experiencing emotion, any emotion, your thoughts are also focused on what you are feeling. This seemingly soft stone carries a powerful healing vibration enabling you to balance your mental and emotional energy bodies. Being able to create and maintain balance is essential for any healing process. It resonates primarily with the Heart Chakra. It is capable of opening and activating all Chakra energy centers. As you open, activate and balance all of your Chakras, you align yourself with the Divine Feminine Spirit of Earth Mother grounding all excess emotional energy. Being a stone of transition, Lepidolite will encourage you to release all that is now behind you, creating a sense of peacefulness within your heart center. As you work with this purplish pink stone, it will help you dissolve the negative effects of emotional wounds. If you are feeling emotionally stuck, hold Lepidolite in your receiving hand allowing its soft, subtle healing energy to flow through you. It will help you release stress and begin to experience a sense of calmness and serenity. You can use Lepidolite to connect with Archangel Raphael, whose name means, He Who Heals. Archangel Raphael will help you heal your heart, our mind restoring emotional balance in your physical, emotional and mental energy bodies and in your Aura. Master Hilarion is the Ascended Master who represents the Divine Healer within you, will help you re-align your physical body with your Higher-Self. As you work with this soft, almost magical stone of conscious feeling, you will eventually activate a connection with that of the Cosmic Consciousness. Establishing a connection with that of the Cosmic Consciousness creates a bridge into your past lives so that you can heal unresolved emotional pain and trauma that you may have brought with you into this life. There are many who seek access to and work the Akashic Records. 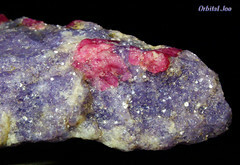 Lepidolite will help you gain access to your Akashic Records. It is my understanding that you are only allowed to access your records and no one else’s without their permission. Do not let this seemingly simple stone fool you it is very powerful as its vibration is that of love, unconditional love and light. It is a wonderful addition to your Crystal Healing Medicine Chest and it will assist you along your Spiritual Journey. « for you and your path …. Thank you for taking time to view this post and for your kind words. It is a pleasure to be sharing the path with you.